Lady Brisienna was also a friend of Lord Naigon Strale, the future Imperial Ambassador to Wayrest. The pair were featured as characters in the novel Mystery of Talara. The novel's depiction of Brisienna choosing "the most public of places for her most private of conferences" is an accurate description of her techniques. Such was the case in 3E 401, when the Emperor learned of the discovery of the Totem of Tiber Septim, an artifact that would allow its bearer to control Tiber Septim's ancient weapon, Numidium. It was in the hands of Lord Woodborne, a minor noble of Wayrest. 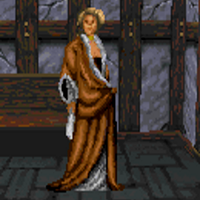 Uriel VII wrote to Mynisera, asking the queen to use her influence with the court of Wayrest to "persuade" Lord Woodborne to give her or Lady Brisienna the Totem, on his behalf. Some claim the letter was actually meant for Brisienna, with a special seal used to alert the Blades agent to this effect. [UOL 1] In the end, however, the letter never reached either of them. In 3E 402, the War of Betony erupted between the kingdoms of Daggerfall and Sentinel. As a result of this conflict, the Emperor's agent was unable to reach Queen Mynisera, and hired a courier to deliver the Emperor's letter when it was possible. 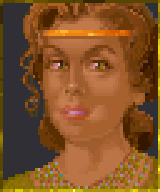 The war ended the following year; Daggerfall emerged victorious, though King Lysandus was killed in the climactic battle at Cryngaine Field (in reality, assassinated). 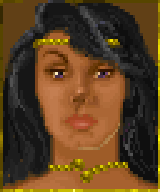 Prince Gothryd was crowned the new King of Daggerfall, and took the princess of Sentinel, Aubk-i, as his new Queen. The courier was finally able to deliver the letter, but as it was addressed to "the Queen of Daggerfall", it was delivered to Aubk-i. Lady Brisienna soon found herself out of favor with the court. With her position compromised and fearing her life was in danger, Brisienna went into hiding. After many adventures, the agent revealed that Lord Woodborne was Lysandus' murderer, and brought him down. Some time after, Lady Brisienna and the Blades sacked Woodborne Hall, but by then the Totem was in the hands of Woodborne's co-conspirator, King Gothryd. 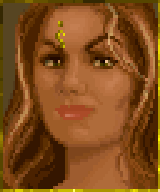 The two operatives met once more, and Brisienna, fearing the power of Numidium in the wrong hands could lead to a civil war, offered the agent the famed Warlock's Ring in exchange for retrieving the Totem from the treasury of Castle Daggerfall. The artifact was recovered, and the word quickly spread; six other powers around the Iliac Bay also made offers for the Totem. And while Lady Brisienna was awarded the Totem, so were each of the other claimants—simultaneously. After one more adventure to recover Numidium's heart, the golem was activated by each bearer of the Totem on the 9th of Frostfall, 3E 417. In what became known as the Warp in the West, time and space were distorted as the Numidium-led armies of Daggerfall, Sentinel, Wayrest, and Orsinium did battle across the Iliac Bay region. The event ended on the 11th, as the Imperial forces—their Numidium's ferocity tempered by the Blades—crushed the rebellious armies and brought order to the region. Numidium was apparently annihilated in the process, and peace eventually settled across the warring lands, though their political borders were permanently changed. Lady Brisienna was known to be in the vicinity of Wayrest during the Warp, but if she survived the chaos, her later actions have remained unrecorded. This page was last modified on 26 February 2019, at 21:41.